I know that’s saying kind of a lot, but honestly, these are really good. So much flavor, so many textures, and actually pretty good for us too, for real. 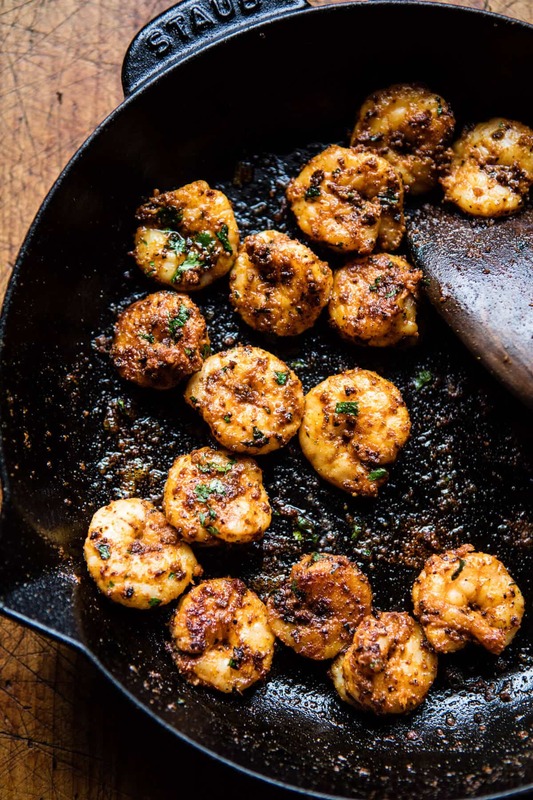 Instead of breading and frying the shrimp, like in a traditional po boy, I seared them in a skillet with lots of spices and a little olive oil. Sure, they’re not breaded and fried, but I swear all the favor is still there and I actually think I prefer the shrimp minus the bread. I mean, you can really taste all the spices this way. And then as if the shrimp was not enough, I of course had to add a slaw. But a sweeter one to balance out the spices, because you know that’s the way I like to do things. Sweet and spicy. Always and forever. 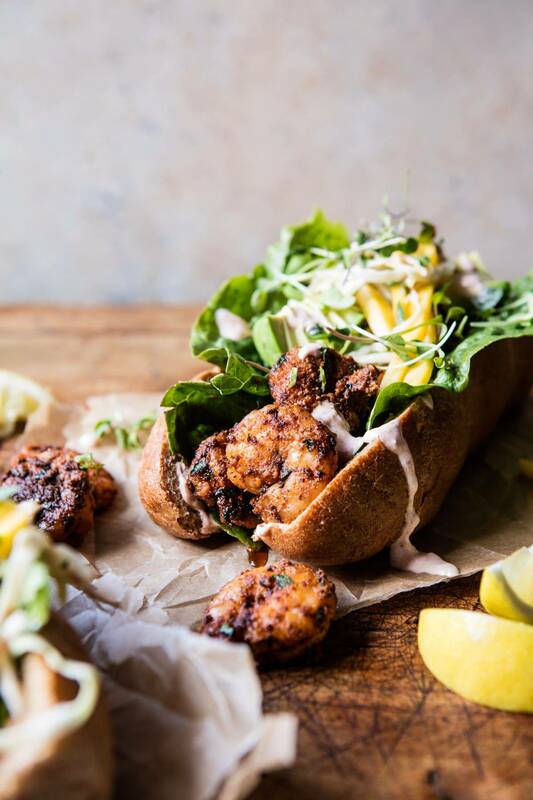 I feel like I have been excited to share these po boys with you for weeks. I mean, I only made them a week ago, but I’ve been thinking them up for a while now, and with Mardi Gras approaching I figured now was the time to share! Plus, it’s Wednesday, and Wednesdays usually need a sandwich like this one. 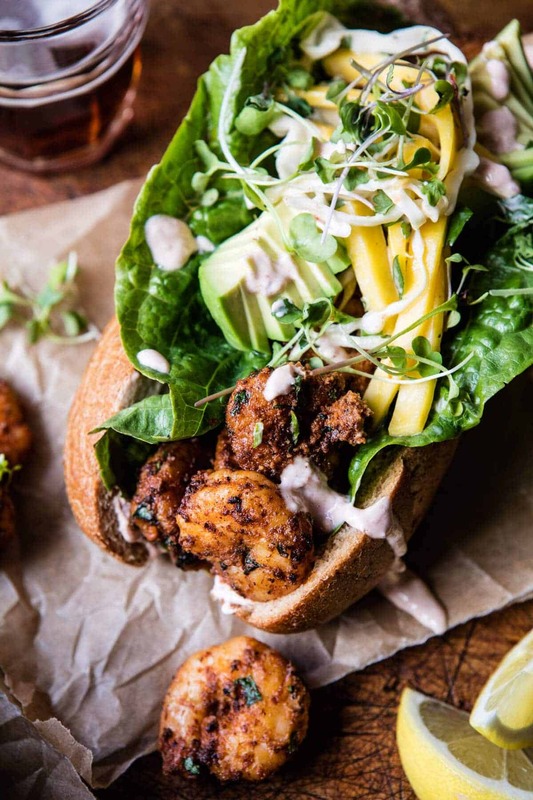 I mean, what’s not to love about a loaded, healthified shrimp po boy mid-week?! I know I’m all about it. Obviously. Normally, I’m not big on making sandwiches, but only because I always have such a hard time photographing them. I dunno why, but they’re just really tricky for me. 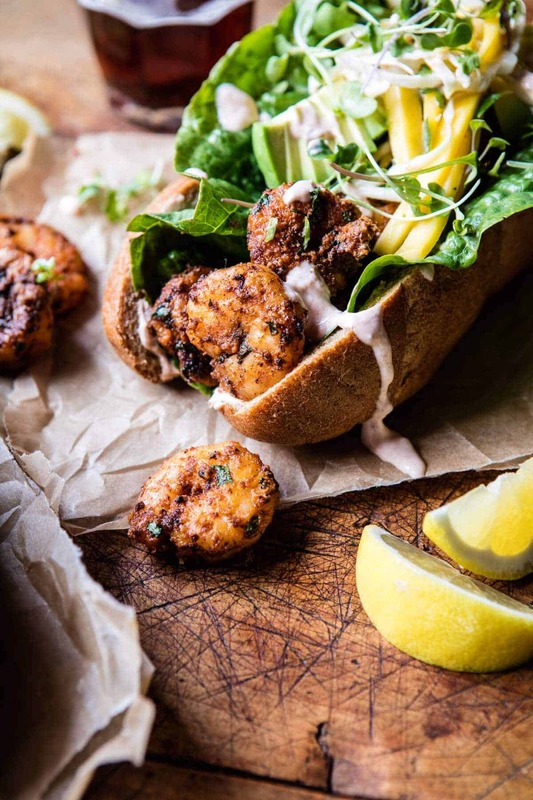 BUT, I decided these po boys were worth the stress of trying to make the photos work. As it turned out, they actually weren’t that bad…bonus! I blame the pretty avocado and mango slaw. They made my day a lot easier…and more delicious! Anyway, back to these yummy po boys. The shrimp is seasoned up with a little creole seasoning, which I think is probably the star of the spices, that and the smoked paprika. The two together add an insane amount of flavor. I also add a lot of cayenne for an extra hit of heat, so be warned, the shrimp is spicy. If you’re not into spicy, just tone down the amount of cayenne in the shrimp. Seeing as I made the shrimp spicy, I wanted to balance the heat with a sweet slaw. You guys know that I am mango obsessed and the combo of shrimp + mango + avocado, was just too good to pass up. It might not be classic southern style, but hey, it’s really freaking good. To keep things on the light and healthy side, I like to used greek yogurt in place of mayo. Again, not traditional, but you really cannot tell the difference, and if I’m being honest, I really hate mayo…but my brother, who may or may not be reading this, loves mayo and begs me to make him YUM YUM sauce to eat with this Korean BBQ every time he’s in town. <– I am determined to fool him one day with a mayo-less YUM YUM sauce. Hee, hee, hee…hope he’s not reading! Possibly the best part about this recipe though…the fact that it is SO easy. I’m talking dinner in under thirty minutes. YESSS. If you want, you can prep the shrimp in the morning and let it marinate all day for added flavor, but it’s definitely not necessary. So, what do you think? After yesterday’s pizza on Facebook Live, healthy Po Boys tonight? 1. 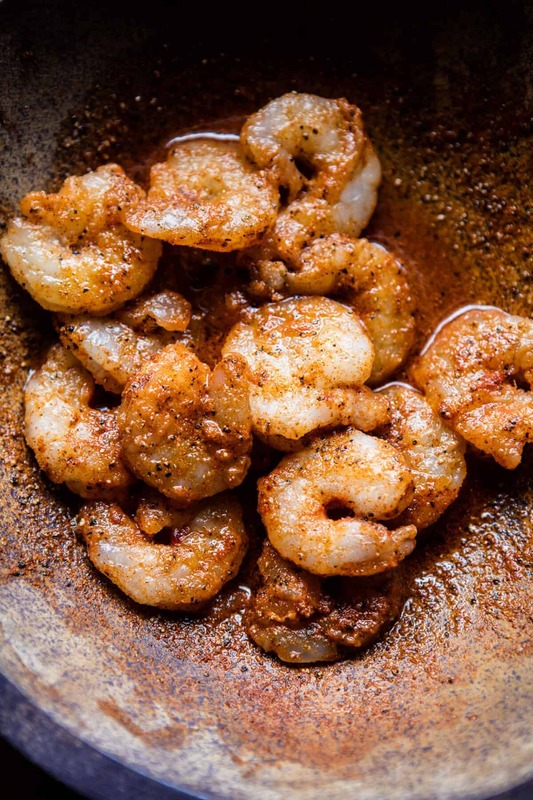 In a medium bowl, combine the shrimp, creole, paprika, cayenne, garlic powder, onion powder, thyme and olive oil. Let sit while you make the slaw or place in the fridge up to overnight. 2. Make the slaw. In a small bowl, combine the yogurt, hot sauce, lemon juice, paprika, and a pinch each of salt and pepper. Taste and adjust spices to your liking. In a large bowl, toss together the cabbage, mango, avocado, and cilantro. Add 2-3 tablespoons of the yogurt sauce, gently tossing to combine. Reserve the remaining yogurt for serving. 4. Heat a large skillet over medium high heat. Add the shrimp in a single layer and cook, stirring once or twice until the shrimp have turned pink and are cooked through. 5. To assemble. 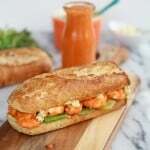 Divide the shrimp among the hoagie rolls and drizzle with yogurt sauce. Top with slaw. Enjoy! ps. My brother is majorly shaking his head at me for using yogurt in place of mayo. <–sorry not sorry. 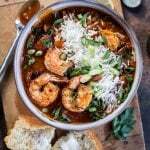 Big Easy Style Saucy Creole Shrimp. Absolutely LOVE this! 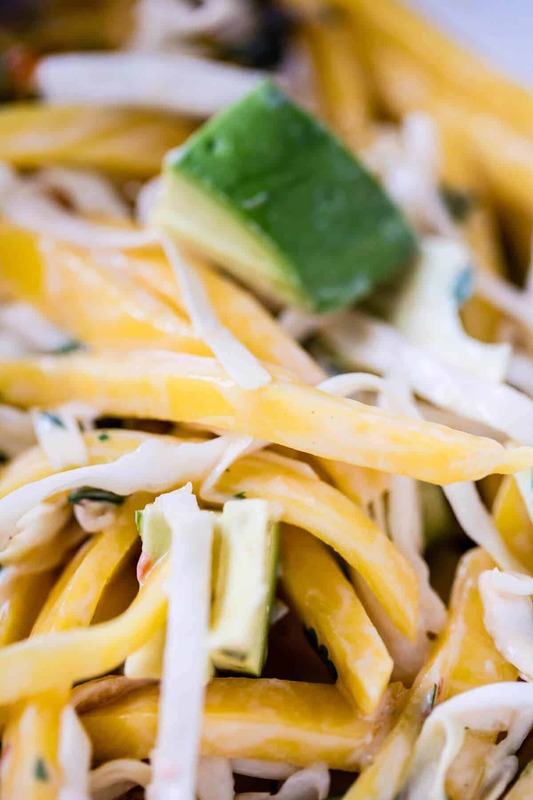 First of all, that avocado mango slaw makes me loooong for Summer as it’s currently freezing cold and STORMING out here… And I think it’s super smart that you made a lighter version of such a well loved dish! Pretty neat tricks in there – I’ve gotta swap mayo for greek yoghurt too sometimes. Thanks for sharing! Ah yes! Thats totally what it made me feel too!! So happy your liking the smaller tweaks, thanks Vivian! I have been curious about Po’ Boys! Think I’m gonna try this soon! Hope you love them Ruth!! This is my favorite sandwich to order when I go to a seafood restaurant near my house. I really like your option just to sear and not to fry or to use breeding. It Makes it looks more healthy. Your photos are always stunning. I don’t think you will ever take bad pictures. I’m a big fan of your style. I hope you do, thanks Corine! Ah I hope you love it Julia!! Thanks! These look perfect, because literally the only thing I don’t like about Po Boys is how greasy they are! Ah yes! Then hopefully you’ll love these! Totally adding these to my dinner plan for next week!!! They sound amazing and SO flavorful! I hope you love them Adrienne! Thank you! This looks so good, I’m going to make it tonight. I am going to scoop out the rolls, to get the dough part out, to make them even “lighter” and with less carbs. A little diced jalapeño in the slaw as well, to add some zip. Thanks for your inspiration and beautiful recipes! Yes, that sounds perfect! Hope you loved them Toni! Thats what i’m hoping everyone agrees (: Thanks Heather! Haha yes!! For a second I was worried then saw the “in a good way” haha! Thanks so much Margo! I’m with you on taking photos of sandwiches/burgers… it is hard!! You still manage to make them look better than like 99% of photographers do, I’m sure. 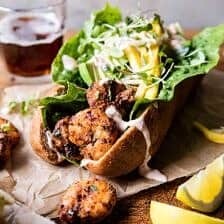 😉 I love po boys and this healthier take on them looks fab! Hi, I could eat this off the page. 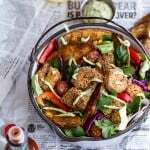 What/where is yum yum sauce? I’d love to try it w bbq. 🙂 Thanks! I love a po’ boy, Teighan. I love that you blackened this instead of frying (not that I don’t love fried). This looks fantastic! My friend, this recipe is KILLING ME!!!! It is so so good. Like drop everything and make it good. 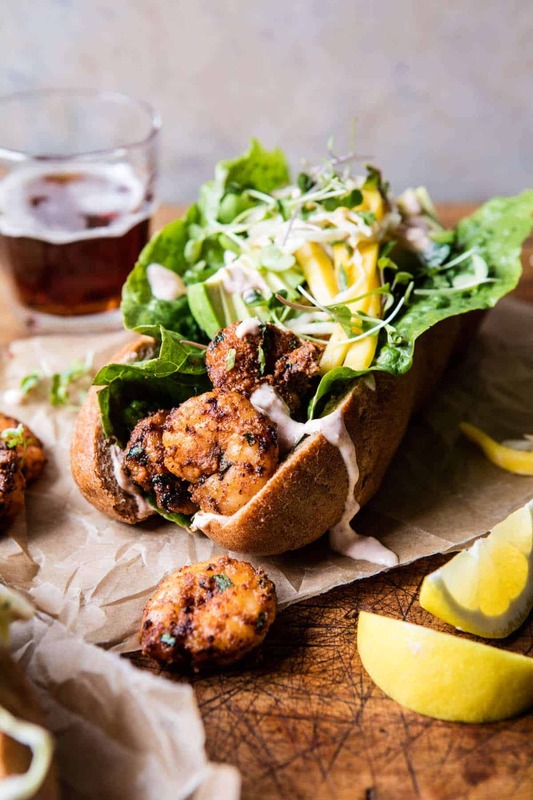 I dunno why po-boy shrimp are usually fried? This looks way better!! And Avo-Mango Slaw! Are you joking??? This combo sounds ah-mazing in a lo-boy sammy like this!!! You are rocking it over here. Way to go! Wow! This comment made my day (: Thanks so much Maria! Couldn’t be happier that you liked it! THESE WERE DELICIOUS!!!!!!!! AND EASY PEASY!!! THANK YOU FOR THE RECIPE!!!! I didn’t change a thing, except I had no bread (but my husband did) and I actually can report I made them instead of just saying they look good!!!!!! YUMYUMYUM You did it again, Tieghan! Hi! My creole has different spices, so maybe some recipes are different. Not sure, but homemade version sounds great! 🙂 Hope you love this! Soooooo…O.M.G. Just cleaned up the kitchen after making this fabulous dish, and I was impelled to comment. It was BOMB! The mango…oh the mango…there are just no words- so I’ll end with this- make no changes, follow the recipe, and fight your husband for the leftovers! Yes!! 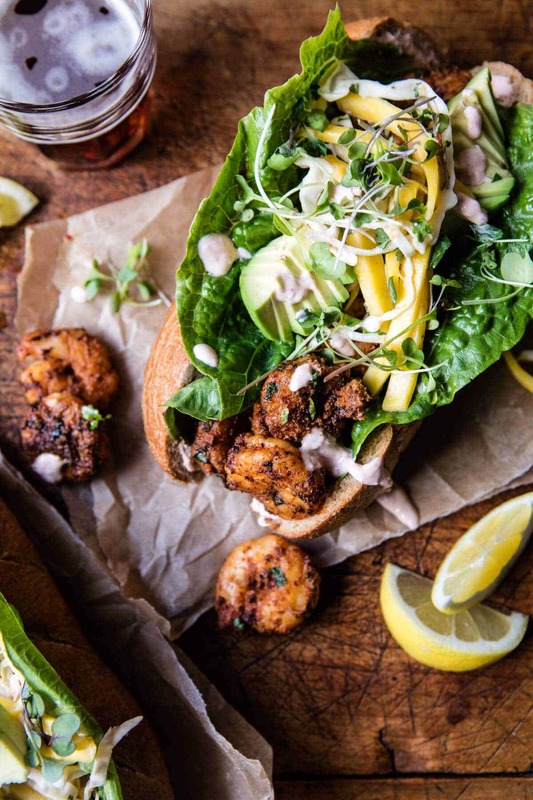 These po boys look so good and I love that avocado mango slaw – perfection! Yay (: I hope you try it Laura, and of course let me know about what you thought! So happy you like it Crystal! Thanks for making! OMG… right now it is 6pm on a Friday night in LA, and I am starving. I tried licking the screen, but that did not satiate!!! Love the pictures and the cajun touch. Plus the twist of avocado and mango, delish. HAHA! So funny, if you don’t end up making the teriyaki make these! They’re DELISH! Thanks Cindy! Thank you Elinor! I am so glad you are enjoying this recipe! I am totally making these as tacos tonight. (So they’re gluten free). I’ll post it in my instagram story and tag you, Tieghan. Hope you loved them! Thanks for tagging me! I’ve been digging through recipes since my wife has been begging me to finally prepare a shrimp dish at home, and I think this is the one. 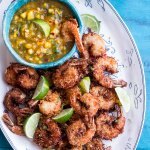 Being a newbie, is there a specific type of shrimp you recommend using for this recipe? Made these the other night… delicious! Added romaine to the buns for some extra crunch. The flavor of the shrimp was so yummy! I am so happy to hear that! Thank you Kayti!